Is it still possible to imagine Brave New World as so many utopians have done in the past? Do mental and geographical spaces exist for presupposing and plotting an epoch-making overturning/overthrowing or, let’s say it, a real revolution, in our drowsing west? In a word, is revolution here and now still conceivable? 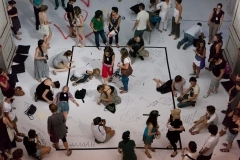 The Plot is the Revolution is the happening that inaugurated a new Motus itinerary 2011<2068 AnimalePolitico Project in July 2011. 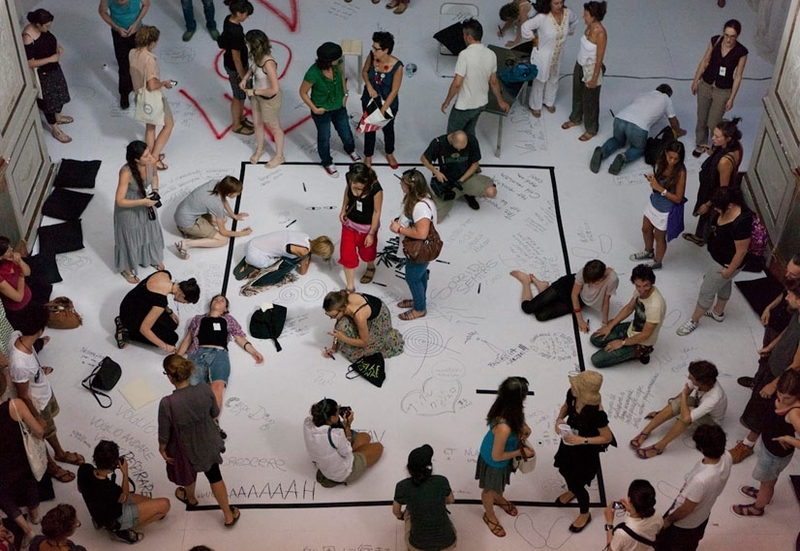 The itinerary unwinds around the idea of plot, the resistant interweave/knit, which attempts to create a transversal community of dialogue and performativity among the arts, setting itself to listen to the transformations under way in order to imagine possible new scenarios. We’re building up a series of Atti Pubblici [Public Actions] which, amid utopias and dystopias, liberating and catastrophic visions, we shall try to involve, with Silvia Calderoni, various artists and freethinkers, actors young and old, children, animals, creatures of the web, economists, scientists, philosophers and political refugees… invited to say their “Long goodbye to today” and to imagine, without limits or restraints, other possible forms of existence, resistance, subsistence, resonance, community, communication, cooperation, living together… and, of course, revolution! Judith Malina, our first extraordinary guest, joyfully opened this chain of “meetings with remarkable men and women” who have experienced or are experiencing epoch-making moments of political transformation. She supplied our title: the audience at Paradise Now were given a map in the form of a diagram which represented the upward journey of the show towards “Permanent Revolution”. Written at the foot of the diagram were the words “The Plot is the Revolution”. This occurred precisely in 1968, when really all the Living Theatre believed that when they left the venue the revolution would be put into action. In January 2011 in New York Judith Malina saw Too Late!, the second contest on Antigone, at Under the Radar… And she was struck by it: it set off a burning dialogue that urged us to attempt a shared experience. We went back to New York in June to set up, at the historic Living Theatre on Clinton Street, a new confrontation/contest, precisely between Judith and Silvia, driven by the explosion of questions that swarm around the word “revolution”, both at an intimate personal level and at a broader “political” one. Questions put to an extraordinary woman who succeeded in revolutionising every moment of her own private and artistic existence. Questions projected in the present and inevitably into an upcoming near future. Questions we also provoked and welcomed from many travelling companions: artists, critics and spectators who took part in The Plot is the Revolution with audio recordings of their reflections and questionings. 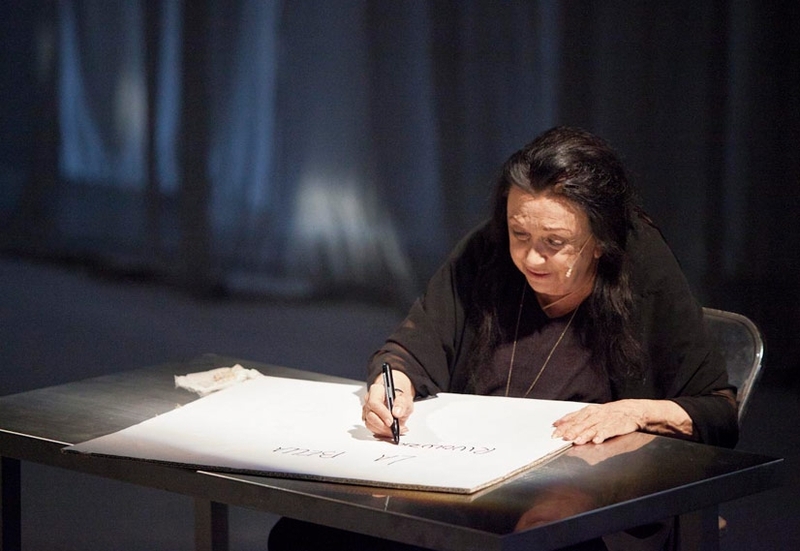 Questions that feed our theatre research for the show NELLA TEMPESTA, premiered in May 2013, but it will not be the point of arrival of this itinerary. Perhaps a process of no-return has begun which is hurling us into the hot spots of the planet in order to seize their telluric forces and accumulate the energy necessary to live “in a world to which you cannot adapt and which you cannot renounce, as citizens, as society-makers”. We staged this “encounter between two Antigones” to share an experiment with the spectators, not a show but a fact, a dialogue between generations, experiences, voices and physicalties that are different but powerfully close, united by the sound of the flame that still leads us to believe in theatre as possibility of action, of influence on the present day. We feel “disappointed but not resigned,” to quote once again the great Paul Goodman who described himself thus. And with courrage (doubling up the r) we are trying to exhume this word and bring it back to the centre of artistic activity as a necessity, and now as a real possibility. 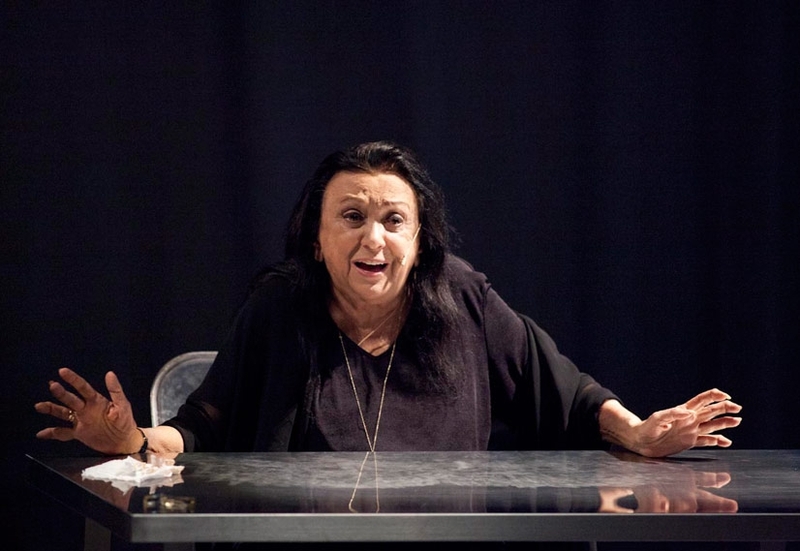 With this theatre adventure we have decided to move towards a place where “there’s something that breaks the order”, that yearns for change… And that’s what Judith, at 85, is still doing. Judith Malina is a piece of history, something she’s extraordinarily aware of though it bores her. And in her way she’s satisfied. What doesn’t satisfy her is that having become history she can’t start up a new mechanism of transformation. If only history could become fertiliser, or nourishment, or colour of the horizon, or slashes of light for the generations to come! If only she could call up from the depths of her undomesticated veins new insubordinations and new experiences of stepping outside experiences, outside the ruts of traditions!